India and Bangladesh had their first bilateral summit meeting here this evening ever since Begum Khaleda Zia became Bangladesh Prime Minister in October 2001, but no breakthrough could be achieved. Have the MPs involved in the MPLAD funds scam been given too light a punishment? The Chandigarh Police today claimed to have arrested four members of the Babbar Khalsa International (BKI) along with 1 kg of RDX, one AK 47 rifle with 15 cartridges, a .38 bore revolver with five cartridges and a 12 bore gun from the road diving Sectors 12 and 14 late last night. 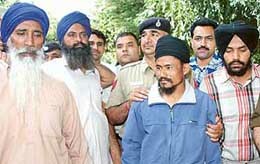 The four alleged Babbar Khalsa terrorists arrested by the Chandigarh Police being produced in a court in Chandigarh on Tuesday. The two-day technical-level talks between India and Pakistan on matters pertaining to crime, human-trafficking, drug abuse, formation of SAARCPOL and immigration began here today after a gap of 17 years. In yet another MiG crash, a trainer version of Mig-21 fighter aircraft crashed soon after getting airborne from Uttarlai airbase in Rajasthan with two pilots on board. The purchase of five Embraer executive jets for VVIP travel by the NDA government has come in for criticism from the the Comptroller and Auditor General for paying a higher price for purchase and overspending an “exorbitant amount” of Rs 126.90 crore for laying fancy interiors and in-flight entertainment on board. I will be giving a new name to the BJP and a new face to it which has lost its moorings and the age-old beliefs and philosophies it was founded on. After her famous breakaway from the BJP and public condemnation of the top BJP brass, the mercurial sanyasin today staged a show of strength in Delhi, ahead of launching her new party next month which she said would be based on core Hindutva ideology. Mr H.S. 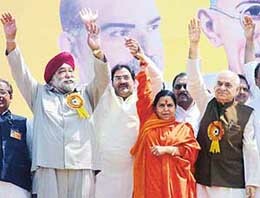 Balli, former Industry Minister of Delhi, Mr Abhay Chautala, Ms Uma Bharti and Mr Madan Lal Khurana wave to their supporters at Janadesh Rally at Ramlila Ground in New Delhi on Tuesday. Stung by bad publicity and adverse public reaction over a television programme on the issue of “Khalistan”, the Punjab Government has sent a report to the Union Ministry of Home Affairs (MHA) explaining the “facts” relating to the telecast and the subsequent circumstances created by it. Sachin Tendulkar, struggling for runs in the Tests, was today ruled out for the entire seven-match one-day series against England due to a hitherto undisclosed shoulder injury for which he will undergo a surgery in London.